Bing Local accounts for almost 30% in local searches. This article is a step by step guide on how you can dominate local search results on Bing. Like Google Local, this will only take a few hours of your time. As a result you will see a constant flow of targeted motivated leads for your real estate investing business – leads that you can easily turn to closed deals. 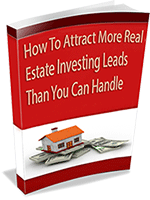 Every real estate investor looks to attract targeted, qualified leads cheaply. How about if you can attract these leads for free? This is possible when you have a prominent position in the search engines – such as Bing Local. This is where local search results become golden. As we have already seen, you can easily get a commanding search position through Google Local. Likewise, you can also get a lot of targeted leads through Bing Local. Just below the sponsored ads, there is only one organic listings, followed by local search results. Just like in Google, the Bing local search results are specific to the local area where you perform the search. The higher you rank in your local market, the more leads you attract – and the more real estate deals you close. Bing local accounts for about 28% of searches, and has claimed about 4% from Google, which can provide quite a substantial amount of traffic. So how do you get to the top in your local market? Most of the tips for getting a high ranking with Bing local are similar to those for Google, so we will be making a lot of reference to the details for Google local. If you have not already done so, prepare your NAP and implement it on your website including rich snippets. Since this step is identical to Google local, these instructions are described in this article. The process of claiming your listing is pretty straightforward in Bing. Head over to bingplaces.com and search for your business. I find it easier to sign in first before performing the search for a more seamless experience. If you don’t have a business already listed, you will be taken through the process of submitting basic details about your business such as phone number, address, etc. You must verify your business first before you can complete your listing. Bing offers instant verification through your phone. Alternatively, they can send you a letter or post card in the mail in 3 to 4 business days. 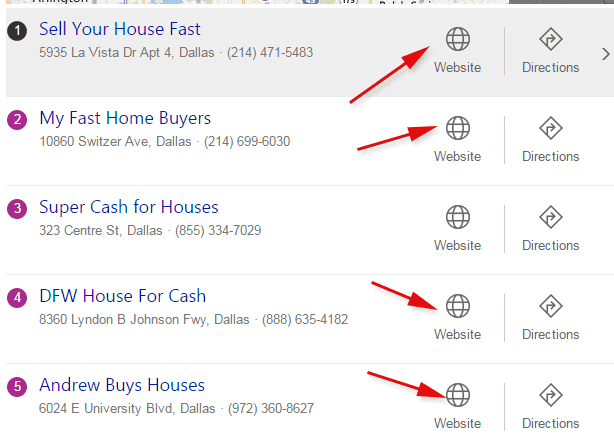 Until you have claimed your listing, you cannot start the process of climbing up the ladder on Bing Local results. Search engines do not want to display stale or inaccurate listings. It makes sense to assume that they will favor listings that seem active. 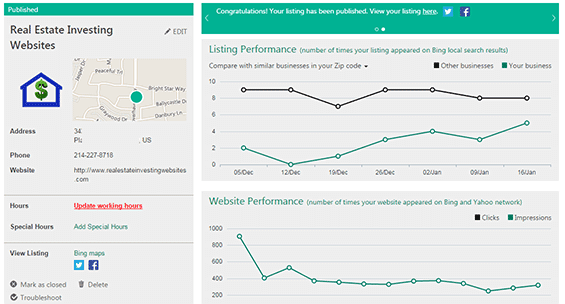 Bing will suggest you review your listing after a few months to make updates. This keeps your information fresh and current. It’s interesting to note that prominent listings on Bing tend to have pictures. Maybe it’s a coincidence, or maybe Bing promotes listings that have pictures. Either way, when you include pictures in your listing, it provides a better experience for your visitors when they interact with your brand. Bing places a lot of importance in the hours of operation, and they will remind you about it. 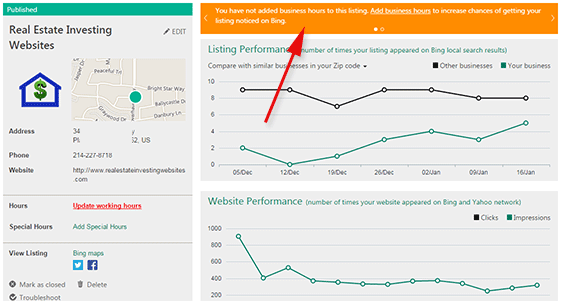 When I do a search on Bing local, I do not see any highlight about business hours. Maybe I’m missing something, but hours of operation will definitely give you a boost. It’s a safe bet to follow Googles rule even in Bing – “your business category should describe what your business is and not what it does or sells”. “We Buy Houses” is not the right category. “Real Estate Consultants” is a good category. Thankfully Bing has an autocomplete feature that will suggest categories for you. You can add more than one category. 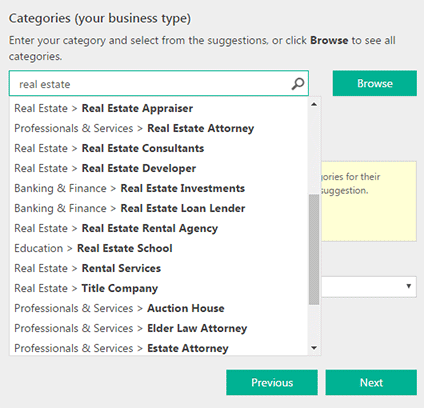 Bing will also suggest other possible categories for your listing and allow you to choose the primary category. Getting your listings in other popular local directories is important in boosting your appearance on Bing. Of course make sure your NAP is consistent across the web to give you a more prominent presence. 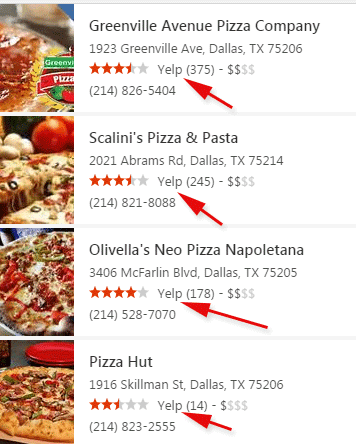 Like in Google local, reviews are huge in Bing. Follow the guidelines for building your reviews to increase your visibility on Bing. Like on Google, the more citations you receive from different places, the higher you rank on Bing Local. Local citations will boost your prominence on Bing, Google, Yelp, yp.com, Yahoo! Local, Manta and more. Good SEO on your real estate investor website is crucial in getting traffic from the search engines. A website that is localized receives more targeted traffic that is more likely to convert to closed deals. The meta title, description, and content should be well optimized to target both your keywords and your local market. Our interactive real estate investor websites are delivered with this in place and make it super easy to target any market. As we have seen, domains that contain the location name rank better than ones that don’t have a location. Need A Website That Attracts And Converts Leads? Get a fully optimized website built to attract and convert real estate investing leads for you. Packed with features to help you buy and sell houses. Whenever possible, getting such a domain will give you long-term benefits that can bring you leads for years to come. 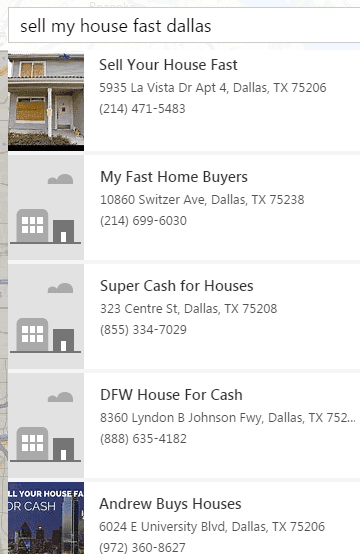 With an almost 30% stake in local searches, Bing will bring a big chunk of local, targeted leads for your real estate investing business if you rank well on Bing Local. Thankfully, the process of getting a good ranking is pretty straightforward. Invest a few hours today to make sure you get this right and reap the benefits for a long time to come. 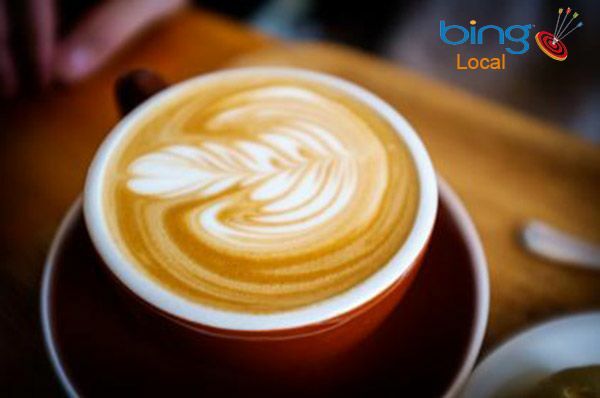 Are you listed in Bing Local? What’s your experience in getting a prominent listing on Bing?